How’s that latest pump working out ??? Yes folks, after hundreds of millions of shares sold over the last few days, and the massive pumping effort by what many believe were Asher paid surrogates… the the PPS closes today at .0002 ! The bright side of the pump is now there are likely scores of brand new truth-tellers who now join the mass of folks who understand what is going on with this company and it’s CEO Mr. Steven M. Samblis. Many feel pity that so many fell prey to the pumper’s misrepresentations, but it wasn’t like they weren’t warned, or like the information wasn’t readily available. The sad part is… given that Asher likely has well over a billion shares to unload (see here), there will likely be more of these pumps, and likely soon. As the company races towards that 4-billion authorized mark… it appears yet another reverse split is all but a certainty. And remember… In Mr. Samblis’s employment contract, he must retain majority control of the company, so the reverse split would need to happen well before the 4-billion mark is reached. WOW… what a hot mess ! So… Mr. Steven M. Samblis, CEO of IC Places… sells the flagship website that so many old time investors invested in. The sale prompts a few questions. 1) WHY was it sold? Why would any CEO sell a proven cash cow like the IC Place.com website? Well… maybe the cash was needed elsewhere. Seems pretty desperate to sell your flagship namesake. Is Asher putting the squeeze on Mr. Samblis because it’s so tough for Asher to sell the collateralize shares now? Perhaps having to resort to the extra expense of paying promoters to pump the stock so hard on the message boards is eating into their profits. Wouldn’t it be poetic justice if they were paid in shares and they were unable to unload them to the unsuspecting novice investors? Maybe that’s why a few of them are still pumping even after the initial massive pump all but failed. 2) Who would buy it? If you look up GVNTV on Google, it looks very similar to Imagination TV. Hummmmm ! Was there any previous relationship between the two ? AND… wouldn’t you love to see the prospectus given to GNVTV on the value and revenue generated from ICPlaces.com? How does one sell something that, according to the SEC filings… makes not one-red-cent ??? Who buys something that makes not one-red-cent? Wow… what-if… the prospectus indicated significant revenue – why didn’t that revenue make it onto the SEC filings ? Lots of questions surrounding this sale ! Perhaps the SEC would be interested in seeing the prospectus, or, perhaps the IRS. 3) What was the sale price ? Will the revenue be recorded in the next SEC filing? Will shareholders see any of the money from the sale ? ICPlaces.com was likely built and maintained with investor funds – will investors see any of the sale proceeds? Are any of the sale proceeds going into entities owned by Mr. Samblis that are not a part of the public company ? 4) The selling of the company’s flagship namesake would seem to be a material event that would trigger an 8-K SEC filing, however some 4-days (at least) since the sale, and no 8-K filing. Those early investors of IC Places, Inc remember all the grandiose predictions for the site, and the company as a result… yet it’s sale does not rise to the level of a material event. Wow… what would then ? So… to all the new bag-holders out there… welcome ! Consider it your moral obligation to inform the next batch of uninformed prospective investors of your experiences. Don’t feel embarrassed, or ashamed… many have experienced a significant loss on this company also. Maybe YOU can prevent someone from experiencing what you, and many others have, by telling anyone who will listen what happened to you. Dilution… you be the judge ! Hello folks… there is still a lot of buzz on the boards regarding Mr. Steve Samblis, CEO of Imagination TV (IMTV). Pumping type of posts from several new comers appearing to attempt to sway newbies into buying IMTV stock. If it weren’t for the integrity issue involved in supporting their efforts, many more disappointed investors would be beneficial to getting the word out about the history of this company, and it’s CEO Mr. Steven M. Samblis. However it would be flat out immoral to suggest they buy stock in the company for a purely selfish reasons based on the history of the company, and it’s CEO Mr. Steven M. Samblis. Notice the $472,107. dollars of convertible notes ??? Also note that the figure is from September 30, 2014… over 7-months ago. Has that figure increased since then ? Also notice the price paid by the convertible loan provider (i.e likely Asher) – wow, how would you like to get your shares at a 65-69 percent discount off the retail price??? AND… look at what the lender pays for the shares if there is a reverse-split… $0.00001 – that’s 4-zero’s folks !!! So… if an investor is in the market to sell their shares… who do you think would win the bidding war for the very few buyers out there? We are not sure how many of those shares would be covered by the anti-dilution clause of the contract, but given that the last reverse-split was done in October 2014, it would be a safe conclusion that ALL those shares were bought at quadruple-zero 1. Do the math on that for a clue to how many shares are being flooded into the market. You’re going to need a really big calculator ! Number two… revenue. There is a post from a poster that they indicate was from Mr. Steven M. Samblis himself. Quoting the text supplied it states “The launch brings in revenues…”. Well, for the sake of argument let’s say that’s true. There are many who believe (and the evidence would support such) that Mr. Steven Samblis is currently making revenue from the web sites he maintains, and the obvious advertising viewers see on the sites. Either Mr. Steven M. Samblis is giving away those ads for free, or, there is revenue being generated from such. Assuming Mr. Steven M. Samblis is not giving the ad space away for free – where is the revenue from those ads ??? It is certainly not being recorded in any of the last several quarterly reports – so where is the money? Given the above… why would anyone think that any revenue generated from the proposed “launch” be added to the coffers of the public company? Apparently none of the current revenue is going to the bottom line of IMTV, so why would any future revenue go there either ? Is it really believable that all the effort AND MONEY ($472 thousand that we can see) that Mr. Steven M. Samblis has poured into IMTV – that there is not one dollar of revenue ? That just defies logic. So… “Good things coming soon…” – highly doubtful based on the 10-year history of Mr. Steven M. Samblis and his company IMTV/PNCH/IC Places. As they say… even a blind squirrel finds a nut once in a while, but in the case of Mr. Steven M. Samblis, he apparently has not found one in 10-years, so the chances are not the greatest he will find one anytime soon. In the meantime, one has to ask… how does he support himself, and pay the expenses of the company if it makes no revenue ??? Can you say – convertible debt ? This is about the funniest thing we have ever seen. This poster is promoting IMTV as a great buy within the message board post, yet their website has the above when visited. It would appear from the graphic they post, that they are indicating the stock is in a severe decline, yet they go on a message board and promote buying the stock as a great buy. Also notice the message box at the lower-right. The highlighted sections states “… our specialist have done extensive due diligence…”. Really ? “Extensive ? Even 2-minutes on Google would provide enough documented information to tell a prospective investor that this company is a huge risk based on it’s previous history and performance. ALL indications are that you will likely lose your investment, as numerous others already have. Notice the highlighted section which states: “…Beware that Internet posters, not only on the original message board where this disclaimer was discovered, but other message boards not limited to the originating website may be increasing or decreasing their share positions in a security regardless of what they are posting and/or may be compensated in some way from a company or 3rd party investor in the company mentioned in the post.” Translated that means… don’t believe a word we post on a message board because we could be flat-out lying to you in order to line our own wallets. So… bottom line is, it is VERY likely that the new posters you currently see on the message boards, posting extremely favorable information about IMTV, and Mr. Steven Samblis, are doing so to make a buck. AND… there is a high likelihood they are being paid to do so. Putting it another way… it’s likely they think you are too stupid to do your own research and find out they are lying to you. Folks… you have seen it said many times – DO YOUR OWN DD before investing ! There are folks out there that will con you out of your hard-earned money, and some of those folks are CEO’s of companies ! There is also a high degree of probability these type of posters, attempting to mislead you into thinking they are personal posters, are being compensated by convertible loan companies like Asher. Investing in penny stocks is risky enough, don’t be mislead into lining the pockets of folks who could care less about you. Looks like after 3 days of surrogate pumping, the effort appears to have failed. Three days ago the PPS was .0002, and today’s close was .0002. Perhaps the message of past performance is actually sinking in to prospective investors. We just wonder how many of the surrogate pumpers actually believe their own hype enough to actually buy the stock. After millions have traded hands (approx $20,000. worth, which is likely all Asher shares), the PPS remains at .0002. Pitiful showing for professional pumpers if that’s what they are. This pitiful performance by very aggressive pumpers might just give Asher some pause the next time Mr. Samblis turns to them for more cash, which means, the cost of getting more cash from Asher will likely involve even more shares being pledged against the “loan”, as Asher realizes it’s growing harder and harder to unload those shares into the open market. Who knows… maybe the pumpers that have showed up on the message boards lately – work for Asher ! 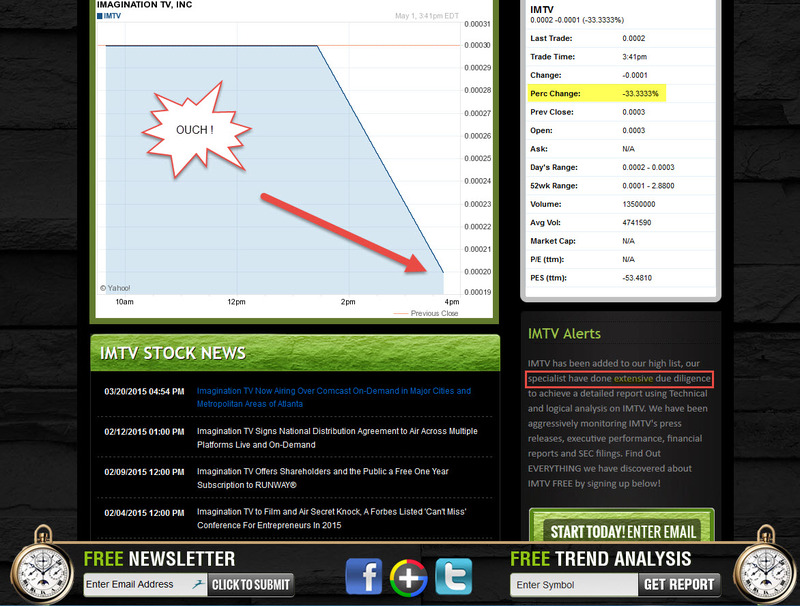 One ironic point… has anyone familiar with the history of IMTV/PNCH looked at the performance of Mr. Joseph Collins URBT stock? Looks like it has steadily outperformed Mr. Samblis’s IMTV stock, closing today at .0012. That is 6-times the value of Mr. Samblis’s IMTV stock. So… a fair question would be… who is the better CEO? AND, notice Mr. Collins has not done ANY reverse splits of his stock (yet anyway), unlike Mr. Samblis who has done 4, and 2 of them in one year, and, doesn’t appear to have surrogates working the message boards promoting a .0002 stock as a great deal because it might go to .0003. One thing about that pesky ole history thing… it tends to follow you everywhere you go. Today, with research being so easy to do online, there is no reason anyone should invest in a company without doing some research on its performance history. And in the case of Mr. Samblis… there is a substantial history trail to forecast the future with. As they say… a leopard never changes it’s spots ! So… perhaps Mr. Samblis should swallow his pride and ask Mr. Collins to come back and help him out, certainly looks like he could use it. Maybe with Mr. Collins aboard Asher can reduce the “vig” a little on the next “loan”. Also, maybe Mr. Collins can help Mr. Samblis advert, what appears to be, an inevitable 5th reverse split.